Windows 10 automatically downloads and installs updates, but a new feature in Windows 10’s Anniversary Update gives you more control over when this happens. 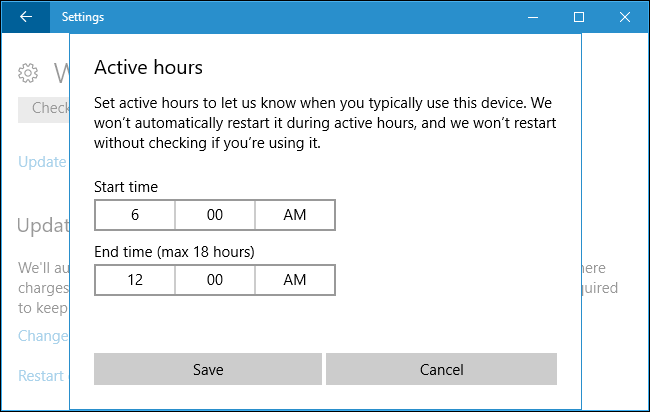 Set “active hours” when you generally use your PC, and Windows won’t restart your computer during those hours. 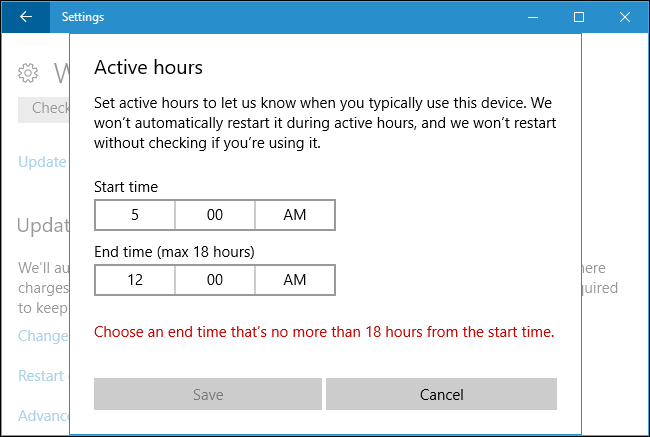 In the Creators Update, Microsoft now allows you to define up to 18 hours of each day as “off limits” and prevent automatic restarts during those hours. Windows still won’t restart your computer while you’re actively using it, even outside of active hours. Head to Update & Security > Windows Update. Click or tap “Change Active Hours” under Update Settings. Choose a “Start time” and “End time” here. You should set the hours during which you generally use your computer. For example, with the new 18 hour range, you can set your “active hours” from 6 AM to 12 AM, or midnight. 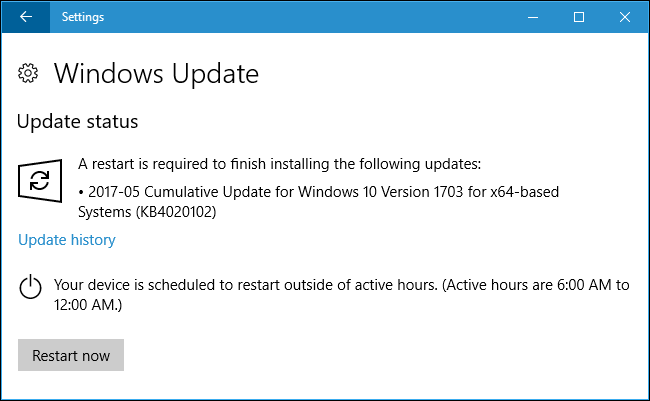 Windows won’t automatically install updates during these hours. 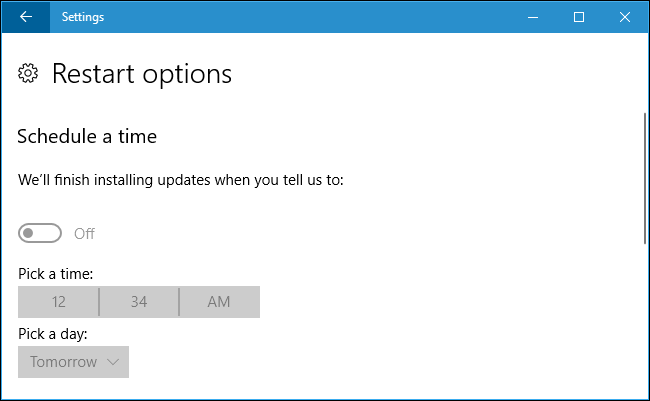 Windows will only automatically install updates and restart during the hours of midnight to 6 AM. Note that your active hours must be between 1 and 18 hours. You can’t go above 18 hours. You also can’t set different active hours on different days, so you can’t specify different active hours for weekdays and weekends. 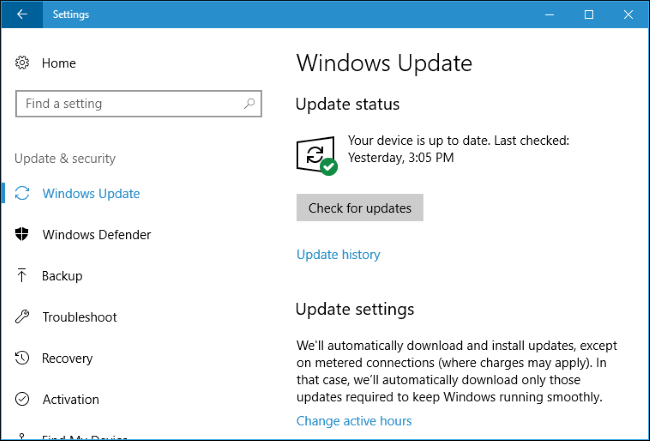 You can temporarily override active hours by heading to Settings > Update & Security > Windows Update > Restart Options. From here, you can set a custom restart time when your device will restart to install updates. This is a one time setting, and you can only set a custom restart time if your device needs to restart to install updates. If Windows needs to restart, you’ll also see a “Restart Now” button on the Settings > Update & Security > Windows Update screen. Use the button to restart immediately and get that restart out of the way so it doesn’t surprise you later.